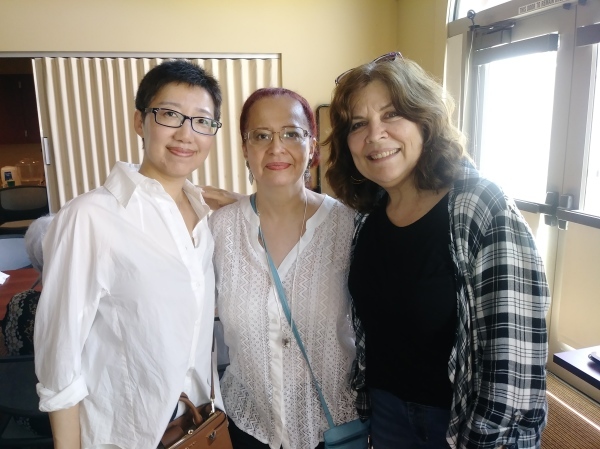 Pictured is the artist (center), Joanna Zhang (left) and Nora Koerber (right) at opening day on Sunday, June 2nd., 2018. Pictured is the artist in front of one of her display pieces accompanied by her mother and friends. 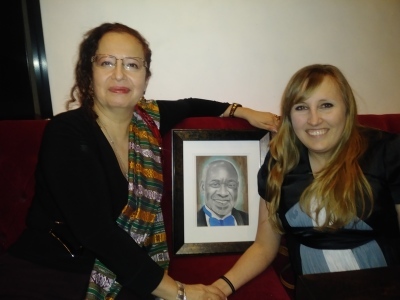 Pictured is the artist, who donated for auction a graphite portrait of Dr. Boachie, the hospital chief surgeon, with Holy Berg, one of the doctor’s patient, who was the auction winner. 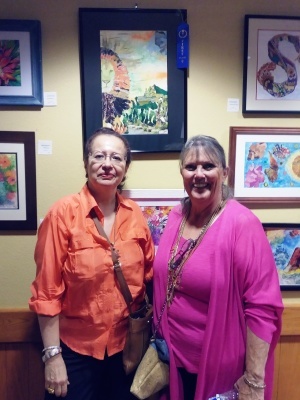 With my watercolor teacher Barbara Metford, in front of my collage painting titled: “Lyon Sol”, which was awarded First Place in the Collage Category. The Dorje Chang Buddha III Cultural and Art Museum, located in Covina, California, opened its Art Exhibit for a week on Saturday October 28 of 2017. 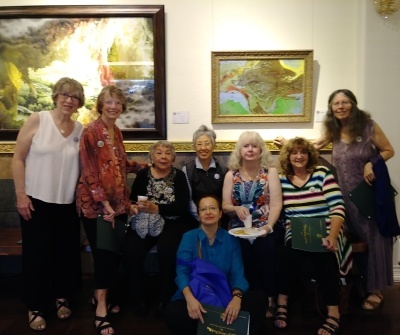 Pictured is a group of participating coleague artists from The Pasadena Senior Center. From left to right: Linda, Helen, Dolores, Jay, Brigitte, Joan, Christine and me. Elena Piedra was invited to participate as a career professional guest for students in grades 9-12 at Mark Keppel Alhambra School on March 02 of 2017. 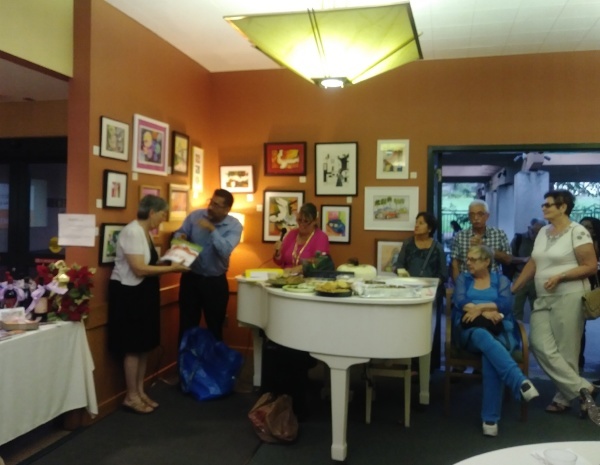 Yearly Art Exhibition at the Pasadena Senior Center held on Thursday September 15 of 2016 and lasting until November 28 of 2016. “Ghana Girl”, an original watercolor painting by Elena Piedra, was donated by the artist for their auction to benefit FOCOS (Foundation of Orthopedics and Complex Spine in Ghana, an accredited hospital that specializes in helping children with complex spine and joint replacement surgeries. This event was held at “La Loggia” restaurant located in Studio City, on March 20 of 2016. In the photo, the artist with Maggie, the auction’s winner. 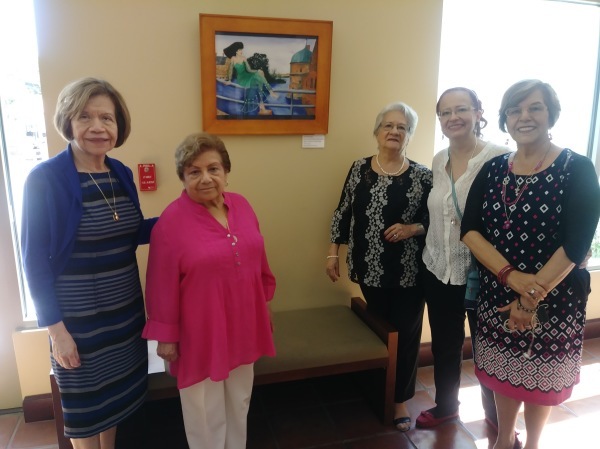 Artists Elena Piedra and Alice Alonzo on the day of their Art Reception at City Hall of Alhambra with their art classmates and their teacher, Nora Koerber. 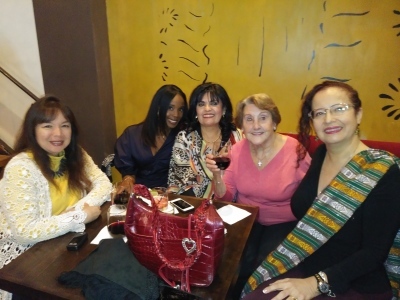 From left to right: John, Loretta, Rosemary, Francisca, Alice Alonzo, Nora Koerber, Elena Piedra and Joanna Zchang.